The EMPAC audience was treated to a preview of a much larger festival in Montreal to occur the following week. Titled “Akousma,” this sound diffusion concert consisted of an array of 20 loudspeakers configured in bottom and top rows, with a few in the middle, all surrounding and above the audience, with fewer discrete channels (at times 8, at times 6, at other times undetermined). The overall sound quality was spectacular (as we have come to expect from EMPAC), with clarity and finesse of frequency response unparalleled. Although the stylistic mission of Réseaux is broad-based, the work of three of the four composers on this concert was rather traditionally oriented in sonic materials I would characterize as granular-based, white noise-derived, rapidly moving sound events usually divorced from traditional tempered pitch/rhythm elements, opting instead for the juxtaposition of gesture, silence, peppered with occasional sections of low key continuity. If this sounds like a general description of your average electroacoustic concert of today, you are right. 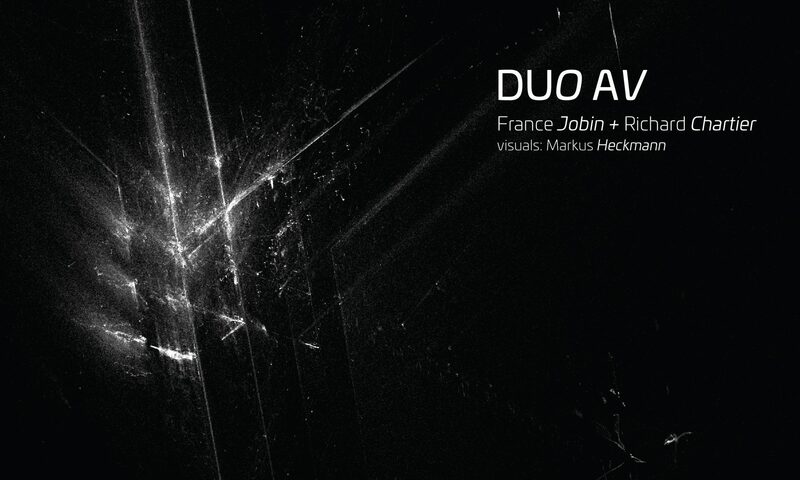 Although these three composers managed to exhibit technical skill in crafting the sound event, there was rarely anything to distinguish one piece from another in this milieu of common practice style that has so permeated the scene for the past decade. One exception to this was a powerfully executed section of “Qui-vive” by Pierre-Yves Macé, in which a quasi-microtonal gestural melodic idea was repeated over several minutes with variations, to the accompaniment of a gradually rising tension in other stratified layers, producing a grand feeling of inexorable forward motion, prompting this reviewer to the conclusion that this common practice style still has room for growth in the hands of a masterful creator. Speaking of masterful, France Jobin’s “Valence of one” forced the audience to sit up and take notice, not because of any new wild gestural statement as we had come to expect, but rather from the sheer quietness and slow pace. The overall scheme was simplicity itself, with two main sections, the first being various derivatives of a major second chord sounding with other fleeting pitches and timbres entering and exiting unobtrusively, and the second, the same the treatment of what was basically a major triad with added sixth. This was punctuated by an occasional piano-like note pinging against the otherwise continuous montage of sound. Twenty minutes later, when this longest work of the evening quietly ended, I was startled, since I felt that I was just beginning to feel extremely comfortable and engaged in a wonderful world where time stood still. It was as if awakening from a deeply satisfying dream. How she managed to engage the audience with such simple means still escapes me, but engage she did, masterfully. ”In the ’80s, I was a synth-pop boy,” says Richard Chartier. ”I was very into that.” But unlike many or even most synth-pop fans, the 40-year-old avant-garde sound artist was more interested in the ”synth” (short for synthesizers) than the ”pop,” the technology over the music. ”A lot of synth-pop bands were not musically trained,” Chartier explains. ”[Synth-pop] was all about this new technology and seeing what you could do with it, and pushing it.” The D.C.-based Chartier also has no formal music training. His work in sound art over the past two decades has been essentially self-taught, honed in no small part through advances in technology. Naturally, Chartier started experimenting with creating sound using synthesizers, egged on by his love of synth-pop. ”The more I got into experimental music, I became compelled to create my own work,” he says. Chartier’s work is characterized by quiet, subtly shifting sounds, in a minimalist strain of sound art known either as “microsound” or Neo-Modernist. Over the past decade, the Hirshhorn Museum and the Corcoran Gallery of Art are just two among many leading museums to have included Chartier as part of sound art presentations. New York’s Whitney Museum of American Art is another, selecting Chartier to be part of its prestigious Whitney Biennial in 2002. Some people in D.C. may remember Chartier from his days as a DJ a decade ago. He was something of a regular at hip lounge-style events, including what the gay man calls a ”pansexual” party called Filler at Adams Morgan’s former Blue Room. 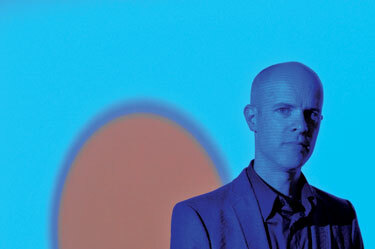 The focus was on alternative, experimental electronic music, or even just ”wacky” synth-pop. Chartier has mostly given up DJ’ing in recent years, though. ”It’s just kind of tiring,” he says. The whole field of sound art is a relatively new area, aided by the spread of affordable, portable technology. Technology has certainly enhanced Chartier’s efforts in the field. After he first dabbled with synthesizers 20 years ago, focused on creating ”droning loopwork,” Chartier says he didn’t really return to sound work until he got an Mac in the late ’90s. Soon after, he started his own record label LINE. Richard Chartier performs with Mark Fell on Wednesday, Oct. 19, at 8 p.m., and the exhibit Data/Fields runs through Nov. 27, both at Artisphere, 1101 Wilson Blvd., Arlington. Call 703-875-1100 or visit artisphere.com. Installation shows data in an unconventional way, invites audience participation. Most people associate data with spreadsheets and charts. But the latest exhibit at Artisphere, “Data/Fields: 5 New Media Installation Works,” challenges data’s unexciting reputation. Works by five international artists are featured in the exhibit, which runs until Nov. 27. The pieces range from sound installations to sculptural video, and explore how people perceive, process and understand information. The works engage the senses by manipulating color, light and sound. Visitors are asked to look at, listen to and even touch the art. “Everyone’s going to have a different experience with these works,” Chartier said. For instance, viewers can interpret Caleb Coppock’s “Graphite Sequencer” multiple ways. The work consists of several paper circles decorated with graphite line drawings, which hang in rows behind a turntable along the gallery wall. Participants can select one of the paper circles and place it on the turntable, which houses a tone generator. Because graphite conducts electricity, visitors can turn the line drawings into sound-conductors and literally listen to the art. “We are in the process of understanding the way in which we are coming to see the world,” said Andy Graydon, a Berlin-based artist featured in “Data/Fields,” during a Skype interview with Patch this week. Chartier originally conceived the show four years ago for the University of Maryland. After two years of work, the project was abandoned as a result of university budget cuts. Two years later, Chartier has finally executed an exhibit that actively explores data and how people process information. “Data/Fields” is a departure from the average spreadsheet. Originally conceived to take place four years ago at The University of Maryland, in the art department where my mother and father were to meet and fall in love, the project was waylaid by the turbulence of departmental budget cuts and postponements before production was finally halted. The show in its current incarnation should then be considered as a condensation and streamlining of Chartier’s original vision. The first presentation of any of the included artist’s work in the DC area, the show marks as well the first US exhibit for both Mark Fell and France Jobin. Straightforwardly a foray into the now familiar tropes of interactivity and data visualization/sonicization in the arts (have the arts ever been anything other than dataviz? Ah, but that’s for a whole other post…), the show is of course not only that. With it’s investigations into the themes of transfinite mathematics, the perception of quanta, and incomprehensibility, the show remains keenly attuned to the sense of the body and percipience of the viewer. (Chartier charmingly describes the viewers of the show ‘percipients’.) In an interview about the opening, Chartier mentioned that it was the longest he had experienced viewers interacting with artworks at a show he had seen in the US; a good sign for those of us who bemoan the meat-packing pace of exhibition viewership today! As is often the case with my interactions with art, the thematic of the observer stilled before incomprehensible magnitude takes me back to the perennially rehashed 2,400 year old question regarding the banishment of the mimetic arts from Plato’s Republic. For Plato the exclusion would have been a question of art’s capacity to besiege its witnesses with a sense of θεíος ϕοβóς. Construing a quick trinity, it’s a concept taken up in an in-depth, Continent.-friendly tenor by Rancière in his recent work on Hegel and Lyotard. (See The Future of the Image, Verso, 2007). Even more recently, for the art historian Donald Preziosi, this a/effect, translated variously as holy terror, fear, or awe, is named as such because it is directly proportional to the work’s ability to reveal the artifice intrinsic to art and by extension the artificiality of all sociopolitical and religious modes of organization. (See Preziosi’s forthcoming Routledge title, Art, Religion & Amnesia: Enchanted Credulities.) Not good news for those with vested interests in maintaining modes of organization as they stand! With its exfoliations, redressings, and retunings of our data and sensoria, dependent as they are upon relatively recent developments within the technoaesthetic apparatus (gigabytes of processing RAM, LCD projectors, and touchscreen interfaces), I’ll be curious to hear from those who make it to data/fields the extent to which it manages to unearth this ancient, but by no means archaic, line of thought. As Paul touched upon in his recent post on The Shifting Imago of Sovereignty the high-speed, transactional nature of data would seem to occupy a unique place in it’s ability to leave us beset by the stupor of fear and trembling. 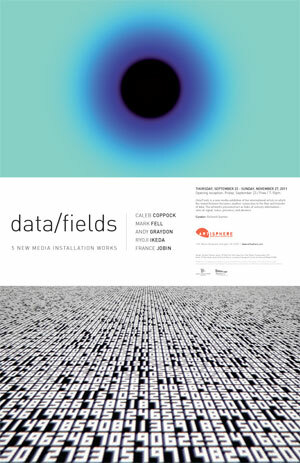 DATA/FIELDS, New Media Installation Works, runs from Sept. 22 through Nov. 27 in the Artisphere’s Terrace Gallery. Free. I hit the opening of Data/Fields at the Artisphere in Rosslyn on Friday, Sept. 23; I’m not totally sure what I was looking at, but it was fun just the same. It’s the sort of show that people stayed to gawk over, and strangers talked with each other about what they saw, said curator Richard Chartier, and that was my experience as well. Viewers just couldn’t help talking to one another at Ryoji Ikeda’s “data.scan.” We stared at a screen that looked just a bit like the old Pac-Man console screen (the ones you sit down to play, back in the day). A series of lines and dots scrolled over it. Three distinct types of screens developed, one looked like static, the other like empty space with red cross hairs shifting through. The final one looked like a video transcription of radio signals or something similar. At the same time, the background sound that seemed random “ping”-ed every now and then, and those pings, we realized, announced that data had been organized or arranged in some way on the screen. It’s about then that someone looked down at the moving crosshairs and said that the ping comes when the crosshairs find a star, Alpha Centauri, for instance. It’s the heavens. That static, said someone else bent close to the monitor, is a string of numbers, tiny numbers. It’s mapping the heavens. “This would be the coolest coffee table ever,” one man said. Chartier told me in a phone interview after the event that Ikeda does not give interviews or talk publicly about his work, but that he is known for seeing data everywhere. Everything can be measured and turned into data, and by choosing the heavens, that sense of infinity increases. “It’s almost like the work is about incomprehensibility. You can’t put your head around it,” Chartier said. In another part of the cavernous room, where white noise and the occasional ping can be heard, people gathered around Caleb Coppock’s “Graphite Sequencer.”The modified turntable picks up electric signals from pencil lines drawn on heavy-stock paper. The graphite in pencil “lead” conducts electricity and sends the signals to the headphones. “Percipients,” as Chartier calls the people who come to the installation, look at the disks hanging on the wall, think about what each might sound like, put a disk on the turntable and don the headphones to hear burps, buzzes, rasps and zzzzzzzzz-es in various patterns. When I showed up at Artisphere to check out “Data/Fields,” a five-artist showcase of new-media art, I encountered a tour for staffers who might need to know what to do should one of the high-tech pieces in the show burn out, blow up or otherwise need to be rebooted. It’s an occupational hazard for today’s plugged-in artist, whose work occasionally requires adjustments more complicated than straightening a painting on the wall. Fortunately, everything in the show was humming and clicking as designed. “Data/Fields” is a sharply installed and smartly edited mini-survey of cutting-edge contemporary art, selected and curated by Richard Chartier, a Washington-based sound artist whose work was featured in the 2002 Whitney Biennial. Incorporating sound, light, drawing and, to some degree, a sculptural component – as well as various combinations of those things – the show isn’t just something you look at or listen to, but rather a little of both. As one of the wall labels puts it, you’re not just a viewer here, but a percipient. The show demands – and rewards – close attention. 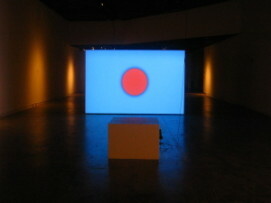 In the center of the darkened gallery is the show’s strongest piece, a computer-generated “painting” of sorts called “Tone Pattern Transactuality.” The Rothko-like video projection, by British artist Mark Fell, is constantly changing colors, sometimes subtly, sometimes abruptly, like some Brookstone gizmo that tracks the stock market by changing from, say, pink to blue. It’s accompanied by an audio track you listen to with headphones. The sound ranges from a quiet hum to what seems like a phaser on overload. It’s intense and, at times, scary. You don’t take it in; it takes you in. 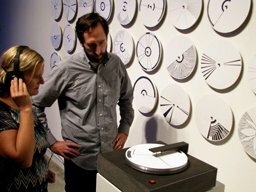 Less frightening, yet more interactive, is Caleb Coppock’s “Graphite Sequencer.” The Nebraska-based artist has customized an old turntable to “play” his own abstract pencil drawings, 48 of which hang on the wall. Take one down and place it on the turntable; the size and shape of vinyl LPs, they’ve all got holes in the middle. Graphite, you see, conducts electricity. So as you watch the drawings spin, electrical contacts on the tone arm – which replaces the traditional needle – create a music of staticky clicks, like Morse code. It’s cool, though it lacks the emotionally enveloping quality of Fell’s work. Around the corner you’ll find Japanese artist Ryoji Ikeda’s mesmerizing “Data.scan,” consisting of a computer monitor set into a console about the size of a Pac Man machine and accompanied by an electronic score that seems to emanate from everywhere – and nowhere. The speakers are very well hidden. On the screen, the images alternate, rapidly, between data based on star-mapping – you’ll spot the name Alpha Persei, and others, if you look hard enough – and television static. But look more closely. That static is actually a screen full of apparently meaningless numbers. Ikeda pulls off an effective, and surprisingly compelling, tension between the cosmic and the everyday. Whose head isn’t filled with phone numbers, passwords and other ID codes these days? Ikeda’s score is so pervasive – it’s the one bit of sound art in the show that you don’t need headphones for – that it spills over into Andy Graydon’s nearby sculptural installation, “Untitled [band pass Arlington].” That Berlin-based artist’s work is just a pile of rubble on the floor. But periodically, a bright, thin band of light, cast by a motorized projector mounted on the ceiling, sweeps over its rugged surface, illuminating its peaks and valleys slowly, like a scanner. Along with Ikeda’s borrowed soundtrack of spaced-out beeps, the work invites extended looking – and listening – for previously hidden details. Taken together, the works in “Data/Fields” sharpen your senses, even as they blur the boundary between sight and sound. The recorded sounds mix with the real ones, tricking the ear in a delightful way. The best time to visit, according to gallery director Cynthia Connolly, is at dusk, when street noise quiets down and you can look across Wilson Boulevard to see computer monitors twinkling in the windows of office buildings just across the street. Come to think of it, maybe “Entre-Deux” does have a visual component after all. Thursday I caught A/Visions II with The Fun Years, Jaki Liebezeit & Burnt Friedman as well as a portion of Martin Tétreault & Michel Langevin. 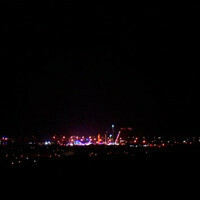 Tight overall, filled with abstract percussion, broken beats ala world rhythms. Tétreault dazzled with a multi-bank of turntables while Liebezeit and Friedman have honed a balanced blend between their disparate world of Krautrock meets dub/jazz. Later in the evening I spent a majority of my deep listening time dedicated to the goings-on at the Savoy (within the Metropolis complex where it was a blend of dub and dance music for party people). I managed to eavesdrop on a touch of both Moderat (a loud crowd-pleaser of techno ala rave pairing Apparat and Modeselektor) and DJ Mala whose intriguing rhythmic flow could have had the crowd on its feet ’til the wee hours. I focused on the more dense and diverse smaller room, however its proximity to the larger had caused for an aural spillover that was distracting at times when the artists performing were headed for deeper bass lows. That said, all were in top form including Anticipate’s Ezekiel Honig whose funky set had a wash of minimal, calculated harmonies layered together like a treasure map. Clinker of Alberta was the evening’s biggest risk-taker, evolving a commissioned Leonard Cohen piece with voice (digital and live), smoke machines and video. He crossed austere religious references with passionate sexuality in an emotional set that was imbued with a certain sense of longing. i8u along with video artist Chika (doing double duty w/Honig earlier) performed a pert 40-minute long set that was simply perfection. The unique culmination between the most minimal acoustics with beats that teased but never fully prompted a pop sensibility. There was something sensual yet very cryptic in this stand-out set of the showcase. Grecian artist Novi_sad’s part of the evening began off the main stage and behind the audience (”chill out” floor area) sans visuals. It was darkly experimental, full with lush drones and lost voices, sound effects and strange field recordings. His set ran longer, but I could’ve gone all night with him. Finally Montreal’s Aun took the stage, making for a continuation of the previous set, but perhaps a touch more ambient…though sleep beckoned and I left about half-way through all was well into the night. unBLOGGED © 2002-2008 TJ Norris. For the remainder of the night it was over to the cavernous Metropolis for a split venue/themed presentation. In the larger room were mostly the dance music, in the smaller space more experimental and quieter or quirky offerings. I tended to spend most of the earlier part of the evening alongside LA curator Robert Crouch watching the mostly female driven evening of music by the wash of heady and physical, cyclical and sensory sounds of I8U, the soft tweaky dissonance and ambient layers of Sawako and my first exposure to the vivacious Bubblyfish doing 8-bit renditions of Kraftwerk songs. The whole intimate space was filled to the gills with an audience craving a very contained experience. This all started with a helmet scream gaming match where two players stood side by side in a race that used their voices to drive motor vehicles. Noisey and fun. review of Mutek 2004 concert by Exclaim!